Regular Adult Bible Fellowships will be taking a break! 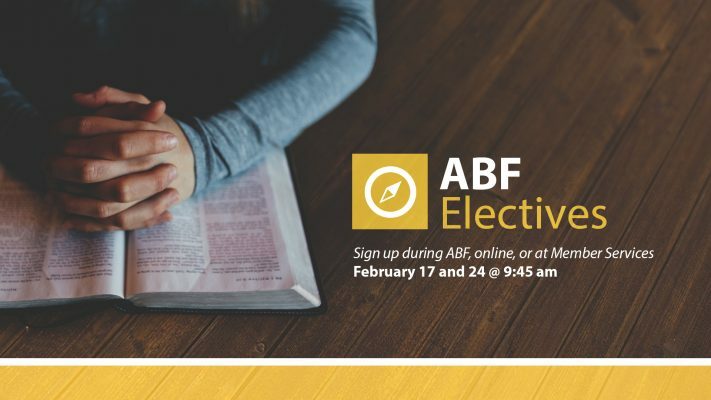 On February 17 and 24, you will have the opportunity to attend one of the elective classes listed below. Classes will start at 9:45 am. Sign up here or at Member Services. How can we take comfort in an all-knowing God? Learning to trust an omniscient God, who intimately and lovingly knows us, can change our daily lives, our perspective in trials, and how to better serve others in crisis. Erica will weave in her testimony of suffering as she encourages you from the Word to strengthen your faith in a God who knows. Just as a musician or an athlete spends much of their life engaged in practice to enhance their skills, so we as Christians must diligently practice the spiritual disciplines if we are to make progress in our goal of godliness. In this course, we will walk through eight of the most basic spiritual disciplines. The content is based on Donald Whitney’s “Spiritual Disciplines for the Christian Life.” Each of us has work to do in at least one of these areas so expect to learn and then get to work. During this two-week session, we will discuss biblical principles from the book “Money, Possessions and Eternity” by Randy Alcorn. Our use of money and possessions is a decisive statement of our eternal values. These lessons are meant to enhance our realization that the everyday choices we make regarding money and possessions are of eternal consequence. The ulitmate goal of these sessions is to help re-align our thinking so that we can become better stewards of the resources God has given us. An overview study of Psalm 37 and 73. Building on his personal history, John will primarily emphasize the principles of victorious Christian living with a secondary emphasis on marriage.